The Wales Public Library, at the corner of Main and Church Streets, around 1922-1925. Image courtesy of the Nevins Memorial Library. The origins of the Wales Public Library date back to 1897, when it began as a collection of books in the corner of a general store. The town had a population of a little over 700 at the time, with woolen mills employing many of its residents. However, these companies began to leave around the turn of the 20th century, and by 1910 the population had dropped by more than half, to just 345 residents in that year’s census. 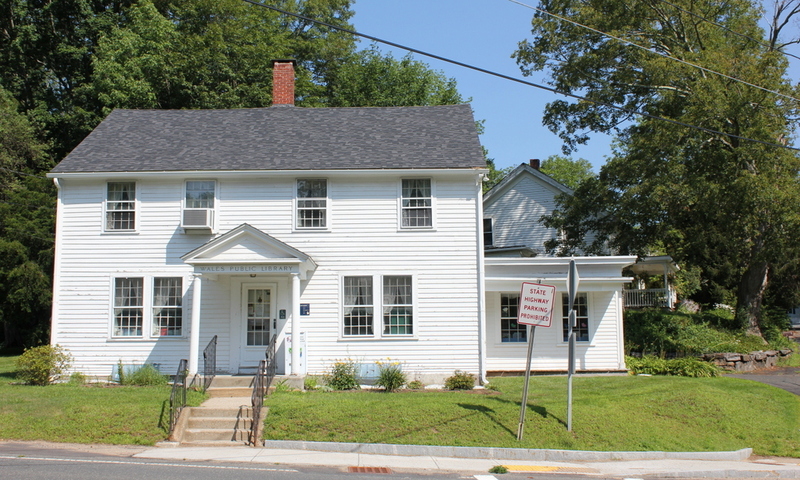 Throughout this time, the small public library continued to operate out of the general store, but around the early 1920s this house was donated to the town, in order to provide a more permanent home for the library. The early history of this house seems difficult to trace. The state’s MACRIS database of historic buildings gives 1841 as the date of construction, while the library itself gives a date of 1825. Either way, it was apparently built by a Stephen Fisk, although maps from the mid-19th century show it as belonging to the Shaw family. By the second half of the century, the house was right in the midst of the town’s manufacturing center, and was directly adjacent to the woolen mill of the Shaw Manufacturing Company. Around 1875, the Wales Baptist Church relocated to this area, constructing a large church just up the hill from this house, which can be seen in the distance on the right side of the first photo. At some point in the early 20th century, this house was acquired by the church, which, in turn, gave it to the town for use as a library. It opened in 1922, following a conversion that included changing the window configuration on the first floor. This helped to balance the building’s appearance, as it previously had one window on the left and two on the right, although the second floor windows were unchanged, resulting in a slightly asymmetrical front facade. The first photo was taken soon after the library opened, and very little has changed in its appearance since then. The church in the distance is long gone, but this building remains in use as the Wales Public Library, with only minor exterior alterations. However, both the town’s population and the library’s collections have grown substantially in almost a century since the building opened, and today the library faces both overcrowding of its shelves and the structural deterioration of the building itself. Because of this, the library is in need of a new building, although to date there have been no definitive plans for relocating. The Wales Baptist Church on Church Street, seen in the distance from the other side of Main Street, around 1892. Image from Picturesque Hampden (1892). 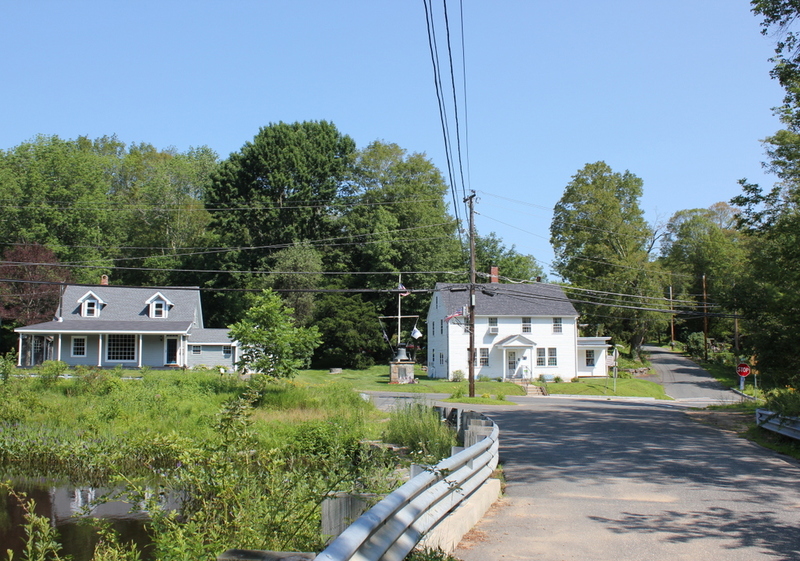 The present-day town of Wales was settled sometime around the 1720s, and was, at the time, a part of Brimfield. It was subsequently incorporated as a separate town in 1775, and was known as South Brimfield until 1828, when it was renamed Wales. As was the case across New England in the colonial era, the area’s settlement soon led to the establishment of a church. However while nearly all of these churches were Congregational, Wales was a rare exception. Its first church, formed in 1736, was Baptist, making it among the first Baptist churches in this part of the state. Other denominations would later establish churches here in Wales, but the Baptists would remain the predominant religious group for many years. 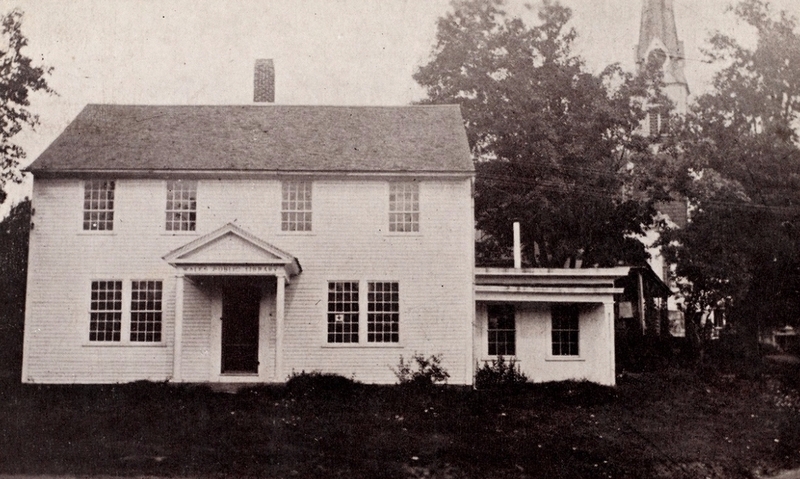 In 1802, the Baptists constructed a new meeting house on the southern part of Main Street, near the corner of Union Road. Along with the Baptists, the building was used by other denominations, including Universalists and Congregationalists, and it also served as the town hall. It would continue to be used as the town hall until 1965, and it is still standing today, but the Baptists moved out of the building around 1875, when they built a new church about a mile away on Church Street, which is seen here in the first photo. At the time, this area had become the town’s manufacturing center, and there were several woolen mills in the vicinity of the church, including one that was located just out of view to the right of the scene. 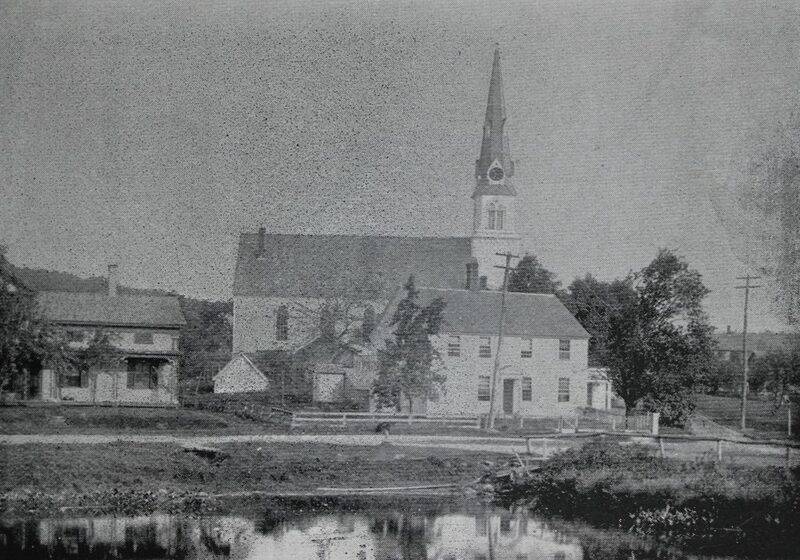 The first photo shows the church as it appeared around the 1890s. The town’s population had peaked about a decade earlier, with a population of 1,030 during the 1880 census. However, the town lost many of its manufacturing jobs by the turn of the 20th century, and the population rapidly declined. Within 30 years, the town lost two-thirds of its residents, with the 1910 census showing a population of just 345. Not until after World War II did Wales see significant growth again, and the town would not surpass its 1880 population until the 1980 census. The early 20th century population loss hurt Wales’s churches, particularly the Baptists, who had built this large church building at the height of the town’s prosperity. They would continue to worship here until around the early 1930s, when the dwindling congregation joined with the Methodists, whose church was located a little to the south of here on Main Street. The Baptists later took ownership of the former Methodist church, and today the Wales Baptist Church continues to hold its services there, more than 280 years after the congregation was first established. As the present-day photo shows, the old 1875 church building is no longer standing. It was evidently demolished at some point after the early 1930s, although the short, dead end road on the irght side of the scene still bears the name of Church Street. Today, the only surviving building from the first photo is the house in the foreground, at the corner of Main and Church Streets. Built in the first half of the 19th century, this house later became the Wales Public Library in 1922, and it remains in use today. The first floor windows were altered during its conversion to a library, but otherwise it still stands as the only recognizable feature from the first photo. The fountain at the corner of Main Street and Haynes Hill Road in Wales, around 1892. Image from Picturesque Hampden (1892). 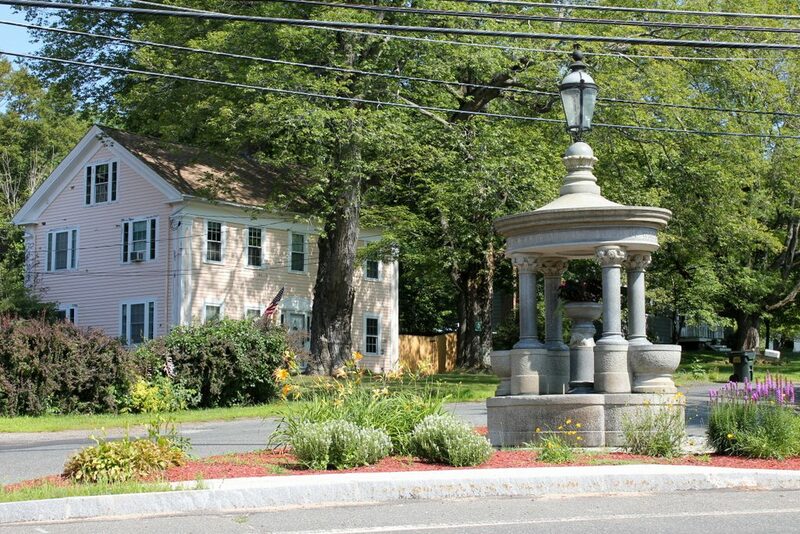 This fountain has been located here on Main Street in Wales since 1887, when it was donated to the town by William B. Howard. Born in Wales in 1832, Howard later moved west to Chicago, where he became a successful contractor. He was responsible for the construction of a number of railroads and bridges, but he was also involved in several other major projects, including the construction of the Indiana State House and the New Croton Aqueduct. 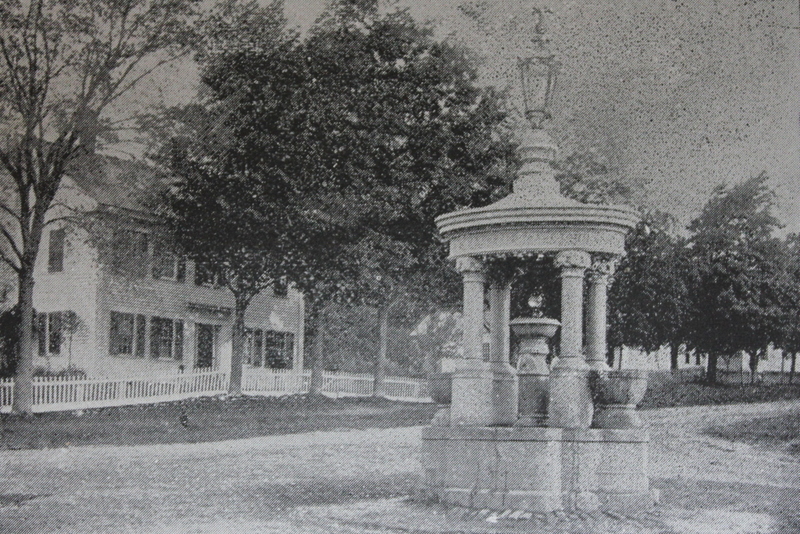 Howard often returned to Wales as a summer visitor, where he stayed at the home of Myles Needham, and in 1887 he gave this fountain to the town as a gift. It was made of granite quarried from nearby Monson, and the design of the fountain is essentially identical to one in Monson, which now stands in front of Memorial Hall. The first photo shows the fountain as it appeared shortly after it was installed at this site. Just beyond it to the left is a house that once served as the parsonage for the Wales Methodist Church. According to the state’s MACRIS database of historic buildings, the house may have been built around 1850, and at the time it was owned by a William Thompson. However, in 1858 the house was sold to the church, which used it as its parsonage until around the turn of the 20th century. The house subsequently reverted to a private residence, but neither it nor the fountain has changed much in 125 years since the first photo was taken, and today this scene looks essentially the same as it did in the early 1890s.